These pics were taken by Chris Bryan. We just got them today. Luke and me. Luke is being "blessed" by the Director, his dad. Here's where I go "off script" and lose it. 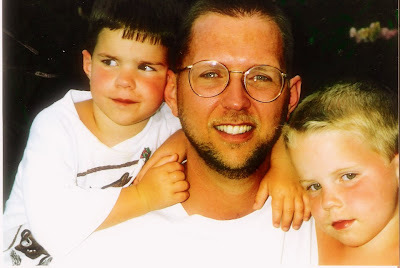 "My son graduates today with Honors"
A big hug from dad. Here Luke gets his diploma from Mr. Bateman, Principal, and his Honor cord from Mr. Wiebe, Board Chairman. Luke and Sandee at the check in counter at the Basel, Switzerland airport. There he goes. Our son heading through security and on to his new life in America. The goodbyes were hard. We miss him already and it's only been 6 hours. Luke and Sandee (and KD) together. Luke had my camera in the backseat of the car. Today was a hot day and he had his feet hanging out the window while we drove. He took these pictures. Is this supposed to be art?? Dad and sons, Luke and Tyler, just after eating out in southern Germany. A long time ago in a galaxy far far away. The view from the restaurant where we had Father's Day dinner. Endenberg, Germany. You can't see them in this picture, but on a clearer day you can see the Swiss Alps bordering the entire view. 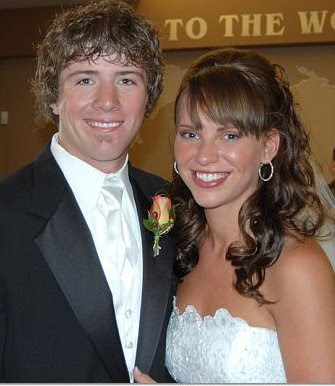 Jena and Josh's wedding on June 9. Jena is Sandee's niece. 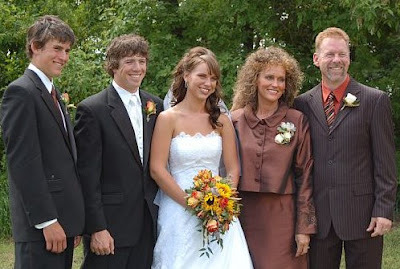 They were married in Canada the day after Luke's graduation. The Poffenroth family: Landon, Josh and Jena, Sherrie (Sandee's twin sister), and Don Poffenroth. 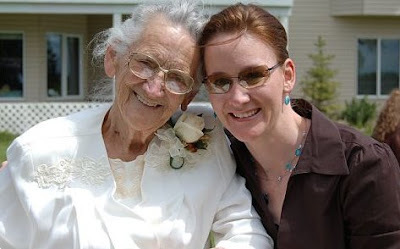 Sandee's mom with granddaughter, Sharla Wilcox (Frank). 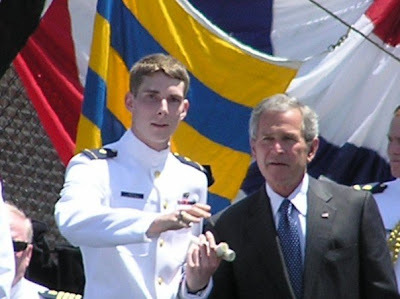 Micah Gentile, BFA graduate of 2003, recieved his graduation diploma from President Bush. In this picture Micah is pointing out his parents in the crowd to the President. We are all very proud of Micah. It's the end of the year picnic. Can't believe it's over. Notice who's signature is on the bottom right. Honor cords waiting to be placed on deserving graduates. Sandee took this picture. Just a few of the 70 graduates visiting our home between midnight and 2:30 am. Sandee said goodbye to Sarah Kim and Christine Cho at 2am. 2am and these kids still have a ways to go. They stayed up all night with each other - saying goodbye to each one. Most of these MK grads will not see each other in a VERY long time. The graduates each gave me one piece of paper currency from their various countries. Each one signed the bill and gave it to me during the graduation ceremony. We will put these together as a collage and put it in a frame. Graduation 2007. Here I am opening the ceremony. Our son, Luke, and friend Adam, coming in to the auditorium to Pomp and Circumstances. Luke standing among his classmates. They are not ALL girls in his class. BFA has a tradition of blessing each graduate individually. Here I am blessing my own son Luke and I almost made it without tears - but not quite. The Director (me) gives Luke a hug as he graduates. Luke receives his diploma from the Principal, and his honor cord from the Board Chairman. Mrs. Laura Hanford, (BFA grad of '88), wife of John Hanford, US Ambassador for Religious Freedom, was this year's graduation speaker. Luke with his "buds" right after graduating. The family and the graduate. Tyler is practicing wearing the Mortar Board. More family. Luke with Uncle Jesse, Aunt Doris, and cousin Shawna Frank at the reception.